The Trust magazine has now been distributed to members by email. Those not on email will receive a hard copy, once we receive them from the printers. We aim to produce an eight-page Trust newsletter three times a year. Thanks to Trust members for their continuing support. Trust chair Keith Morgan, an accountant and football finance expert, gives the lowdown on the latest Cardiff City accounts. The following is my commentary on the audited accounts , which were signed off and approved by the board of directors on September 19, 2018 and by the auditors on September 26, 2018. 1. There was a net loss for the year of £36m, compared to a loss of £21m in the previous year. However, the loss of £36m was reduced to £9m overall by a stadium revaluation surplus. The main reasons for the movement in reported annual losses and comprehensive expense is summarised below. 2. Despite the above loss, due to a very substantial conversion of debt to equity by the group`s principal shareholder, the group`s balance sheet position improved significantly, with net liabilities reducing from £81mto just under £11m. 3. The group remains highly dependent upon the ongoing financial support of the principal shareholder Tan Sri Vincent Tan. The accounts refer to his pledge to continue such support in the foreseeable future. The club enjoyed a very successful season on the pitch, with promotion to the Premier League. Average match day attendances were up from 16,564 to 20,164 and it proved easier to attract sponsorship and other commercial income. Match day income increased by £1.3m, broadcasting income by £0.8m and commercial income by £3.9m. As a “cost” of promotion to the Premier League, the club made very substantial promotion bonus payments to players and other playing staff. In addition, costs were incurred in respect of additional fees payable in transfer fees to other clubs etc. triggered by promotion. These costs totalled £23.2m in the year. This was largely due to a reversal of an impairment charge of £5.5m made in previous years against the club`s stadium. Each year the club has to assess whether its assets (stadium, playing squad etc.) are worth less than the value at which they appear in the accounting records and adjust accordingly. As a result of a stadium revaluation (see below) a previous impairment charge was deemed to be unnecessary and was reversed in the May 2018 accounts. Other administration expenses increased by £2.9m in the year. These costs are not analysed in published annual accounts. The club made less profit on selling players in the year – £2.4m compared to £5.5m in 2016/17 season. The club`s tax computations for the year resulted in a tax credit benefit of £3.3m in the profit and loss account. Net finance costs reduced in the year by £0.6m. The two main factors in this were a reduction of £1.2m of interest paid to Tormen Finance Inc. (a company in which club Chair Mehmet Dalman has significant influence) whose interest bearing loan to the club was paid off in the year and an increase of £0.6m resulting from a technical tax adjustment required to account for long term shareholder loans. These both significantly reduced in value and were reclassified between current and non-current liabilities in terms of potential repayment dates. At the financial year end, the club obtained an independent professional valuation of the stadium from Savills (UK) Limited. The valuation, on what is termed a depreciated replacement cost basis, was £83.5m compared to its previous value in the accounting records of £54.2m giving a revaluation benefit in the profit and loss account of £29.3m less a related tax adjustment of £2.3m. The stadium value in the balance sheet now reflects what it would cost to replace it with a similar stadium asset. It is held on a 150 year lease with Cardiff County Council, the lease start date being September 2009. These are not analysed in published accounts, so cannot be commented upon in detail in this report. However, they are likely to include expenditure on costs such as agents` fees linked to player signings, player loan fees (in lieu of permanent signing fees), player contract termination fees etc. They also are likely to reflect costs associated with generating the additional income referred to above. The above two adjustments improved the balance sheet by £106m. Trading losses before the revaluation adjustment of £35.9m reduced the improvement down to £70.1m. During the year , players costing £14.3m were added to the squad whilst those originally costing £30.8m (depreciated down to a net value of £0.5m) were disposed of at a profit of £2.4m.The playing squad overall as at May 31, 2018 had an accounts value of £12.2m. A note to the accounts reveals that player purchases between the year end and the date the accounts were signed off (i.e. players signed in the Summer 2018 transfer window) were at a cost of £35.4m , of which £2.6m only becomes payable if the club is still in the Premier League next season. The club had £0.2k of stock, £7.4m of debtor money due to it(including the £3.3m of tax credit referred to above), and £2.9m of cash. These are debts due by the club which fell due for payment on or before May 31, 2019. Of the total of £115.6m , by far the largest element was £72.4m due to Tan Sri Vincent Tan of which £50.1m attracted interest at 7% a year (all interest waived up to May 31, 2018) and all of which is secured against the group`s assets. The total due to TSVT was greatly reduced in the year as a consequence of his debt to share conversions mentioned earlier in this commentary. Other current liabilities include such items as transfer fees payable and season ticket income for season 2018-19 already received in advance as atMay 31, 2018, plus the promotion related bonuses of £23.2m paid after the year end. A loan of £11m due to Tormen Finance Inc. as at May 31, 2017 was repaid during the year to May 31, 2018. As at May 31, 2017 £115.1m was due to the club`s principal shareholder. Part of this has now been converted into shares and the residual balance is reflected in Current Liabilities above. The audited accounts have a note referring to major transactions which occurred between May 31, 2018 and the accounts were signed off as approved by the directors September 19, 2018). Football transactions in the period have already been commented on above. In addition, the accounts notes reveal that a loan facility of £28.3m was entered into in the same period with an unrelated (i.e. not a shareholder or director) party to help provide the group with additional working capital to fund ongoing trading activities. 1. The club made a substantial loss of £36m in the year before the benefit of a £27m stadium revaluation. However, £23m of this loss related to an exceptional, one-off cost of promotion bonuses to players and playing management. 2. The club`s balance sheet position dramatically improved in the year as a result of debt to equity conversions by its owner and the stadium revaluation. 3. The club remains confident that it will remain compliant with football`s Profitability and Sustainability requirements, particularly following its promotion to the Premier League at the end of 2017-18 season. 4. The above promotion has been a major boost to the club, both from a footballing and a financial aspect. In the absence of the promotion, the club would have faced season 2018-19 without the benefit of any parachute payments with the financial implications that would have incurred. Trust Board Member Tim Hartley has written an article about the reaction to the tragic plane crash involving our new striker Emiliano Sana. Tim details responses from a selection of supporters’ groups at other Premier League clubs. 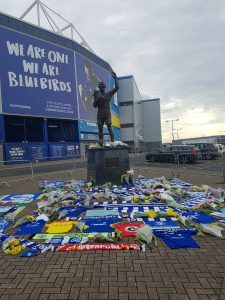 Maybe it is too soon after the event to make any sense of the tragedy of the possible death of Emiliano Sala. Perhaps we never will. What we do know is that everyone associated with FC Nantes, Cardiff City FC, indeed the whole football family, are grieving the loss of a young man who was at the top of his game and was genuinely excited about joining his new teammates in the Premier League. Fans have put aside any rivalry they may have had. The game of football, our club’s prospects, new signings and the fear of relegation have all taken a backseat while we share a common grief. 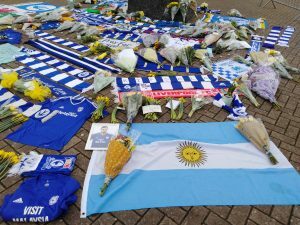 Few in Cardiff had ever seen Emiliano play but we still feel the pain his family and friends in Nantes and Argentina must be feeling. We at Cardiff have been here before this season. After Leicester City’s owner, VichaiSrivaddhanaprabha, and four other people died in a helicopter crash, the Foxes’ first game was against Cardiff. There was an outpouring of sympathy as supporters exchanged flags and players and staff from both clubs joined together in an emotional tribute. It has been gratifying on the loss of Emiliano and his pilot to have received condolences and messages of sympathy from so many supporters’ groups. The coming together of the ‘football family’ may sound something of a cliché but as the selection of messages from fellow fans below shows, when the chips are down, it is very real and we are truly grateful for it. We’re delighted to announce that the Trust has raised a total of £2,233 for @TheWallich, the charity that helps homeless people in Cardiff and across Wales. Apart from the Manchester United match-day bucket collection which brought in £1,783, the Trust raised £300 from a quiz organised at The Arches pub in Llanishen. The Trust also made a donation of £100 and £50 was raised from a raffle at our annual general meeting. We all see daily the impact of homelessness on the streets of our cities and towns so we’re pleased to have been able to help the vulnerable in a small way. Thanks to everyone that contributed and to Cardiff City Football Club for supporting a bucket collection at the Manchester United game. A bucket collection in aid of the Trust’s supported charity, The Wallich, raised £1,734 for its work with homeless people. The collection before the Manchester United game was generously supported by Cardiff City fans attending the big game. 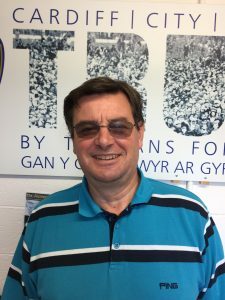 Michael Cowley of The Wallich wrote to Cardiff City and The Trust following the collection. He said: “I am really pleased to let you know that we raised £1,734.69 which is an amazing amount for us as it will prevent around 50 instances of rough sleeping in Cardiff by paying for 50 bed spaces at our Cardiff Nightshelter. The Trust chose The Wallich as its charity for the current season after considering nominations from members. We at the Trust hope that everyone had a great Christmas and will have a happy and healthy New Year. The club has had a great finish to 2018 with an away draw at Crystal Palace and a superb win at Leicester. Next up is Spurs, which will be tough, but who knows what can be achieved with the spirit in the CCFC squad. One constant throughout the season to date has been the brilliant support of the fans, both home and away, even when the team has struggled on the pitch. This has been acknowledged by the team and the whole club as a huge contribution to the fight to keep the club up in the Premier League and will continue to do so for the rest of the season. Again , Seasons Greetings to everyone.